Let's talk about GMOs, series introduction. Over the past two weeks, I have seen the responses to my blog post and the posts of others. I see a lot of confusion on the techniques, results, safety, ethics and current application of GMOs. However, I am well aware that I do not know everything. Let's look at various aspects of GMOs and learn together. What I want to do is to look at the entire process of GMOs. In this post, we will focus on what the concept is. What is DNA? How does it work? Can we use that for agriculture and other things? In the next post, we will look at the techniques necessary to realise that concept. This will introduce a striking difference, as a revolution towards a new and fancy technique called CRISPR/Cas9 has just taken place. When we know how they are made, we can look at what we are currently using them for. Can we see how the technique has been applied currently? Of course, after looking at the past and present we will move on to the future. What can we use them for? What are ideas are currently under consideration? Hold on, we also have to discuss whether or not they are safe. Isn't it dangerous to mess with DNA? This is an oft-discussed point, and I think it has merit to look at it clearly. There are some other issues surrounding GMOs that have a lot of people upset. I can imagine this, and we will have to discuss them. For this, we look at the application of GMOs in farming. Don't worry, we will spend some time talking about pesticides, seed saving, patent law and 'industry' as well. After we have discussed the concept, the techniques, the current application, the future application, their safety and the surrounding issues, we have the information to discuss the ethics of GMOs. I have to warn you, that means I will actually discuss ethics - not make a verdict, but discuss differing viewpoints of ethics on the issue. At that point, we can discuss regulation. Not only how GMOs are currently regulated, but also how we ought to be regulating them. That said, let's review some science. We will continue to use the rather sloppy label of "GMO". Both of us have some sense of what we mean; laboratory-bred varieties that have their DNA sequences deliberately altered by engineers. 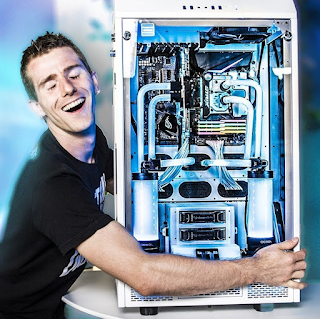 Before I move on to the review we need to continue, I'd like to tell you who I am. I am a recent graduate of Delft University of Technology, specialised towards theoretical quantum condensed matter. I am now employed at the TU Delft as non-academic support for biophysical research (i.e. I do not do research, but help others with their setups, software and data analysis). This blog, my website and my Facebook page are mine, and mine alone. The content I write here is mine. There are no conflicts of interest. I write about issues I care deeply about. At the end of this series, I hope that you see why I care about this. Science Review: What is DNA? 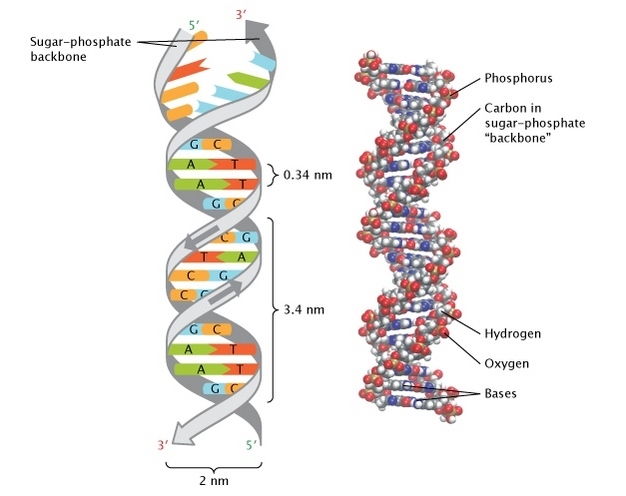 3D helix structure of DNA (source: Nature). Schematic (left) and realistic (right) depictions. A long time ago, Charles Darwin explained the variation in the natural world. He did this by positing one mechanism of inheritance and mutation. If this was present, as had been observed, it follows that (natural) selection should lead to change, accumulating to give us the transmutation of species. He didn't know the mechanism, but we do. The genetic information of every living creature on this planet - and even some that are differently alive - is stored in the same base form. A long period of the 20th century was spent trying to discover the mechanism, leading to its discovery in 1953 and the award of the 1962 Nobel Prize in Medicine jointly to Crick, Watson and Wilkins. At its simplest, DNA is a very long chain. DNA means Deoxyribonucleic acid. It describes a molecule that consists of a sugar backbone, to which nucleotides are connected. The sugar backbone is a long, stable skeleton. Each link has a nucleotide connected, which is often referred to with a letter. In most life, these letters are A, C, G and T. The nucleotides are Adenine, Cytosine, Guanine and Thymine. Often, we refer to a (small) strand by writing down its letters. For instance, we could speak of an ATCAGTCG strand, or refer to the letters as the code. These are molecules, specific arrangements of atoms with shared electrons. Sharing electrons indicates a bond between two atoms and, depending on the specifics of the sharing, it can mean an almost unbreakable bond. The specific arrangements indicate a specific distribution of charge and thus electric field. 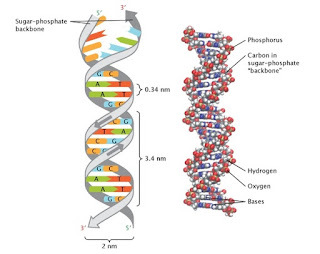 In that sense, each nucleotide connected to the DNA backbone can be seen as a weird magnet. It has two poles, but its north pole can only connect to a specific south pole. It turns out that these poles are such that A's pole connects to that of T, and C to G (we say that these nucleotides are complementary). Two strands of DNA that are complementary, meaning that each nucleotide in one strand is replaced by its complementary nucleotide in the other, will have an electrostatic connection. This is far weaker than sharing electrons, but it still binds the two strands together. Due to the specifics of the skeleton, such a double strand will turn into a double helix. While this might seem miraculous, I must point out that different backbones and different nucleotides exist. In the first phase of life, it is supposed that it did try the alternatives. This primal form of genetics was already undergoing evolution by natural selection, and this made it settle on a specific backbone and specific nucleotide. What could it select for? Well, rate of self-replication, lifetime, measure of heritability and variability, and so forth. How does this explain variation and heritability? Well, the molecular machines aren't 100% foolproof. Sometimes, they make mistakes - in the sense that they put the wrong nucleotide, the wrong letter, down. Sometimes, it is an outside source - say, radiation or a mutagen. It doesn't really matter; the change in the genetic information is there. If that is the genetic information involved in reproduction (for us, DNA in egg or sperm cells) then offspring inherit. DNA isn't a blueprint. It contains information, yes, but that information is used by the machinery of the cell. DNA is the stable molecule, storing most of the information. As such, it is unwieldy. How does it translate to the changes we see between animals? 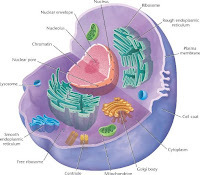 Depiction of Eukaryota cell structure. proteins are made in the Ribosome. The central dogma of molecular biology explains how this happens. DNA typically codes for one of two things. First, it can code for controlling other parts of the code. Second, it can code for a protein. Proteins are very large molecules in a specific spatial confirmation. One or more proteins together can act as molecular machines of what seems impressive specific functions. In the group where I work, we do research into the way these molecular machines go about their business. Coding for controlling other parts of the code means that a molecular machine 'reading' the DNA gets instructions for what to do to other parts of the code. Coding proteins is harder; the DNA itself cannot do this. 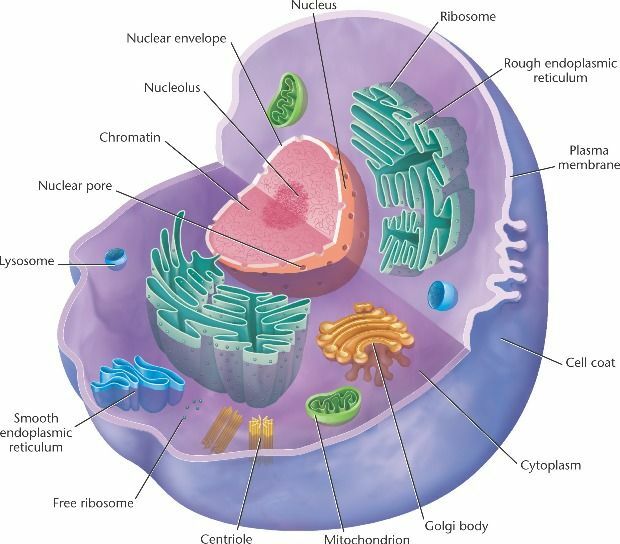 In Eukaryota, the domain of life to which animals and plants belong, the DNA is stored inside the nucleus of a cell. Another part of the cell, the Ribosome, is the molecular machine making proteins. 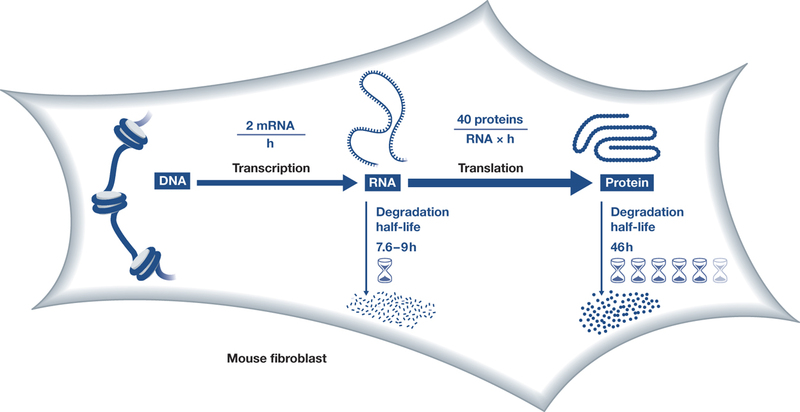 Central dogma of molecular biology. On the left, you see DNA. If it looks weird to you, that is because it is rolled up for storage by a molecular machine called a nucleosome. The machines reading the DNA send out messenger RNA, which is less stable but cheap to make. 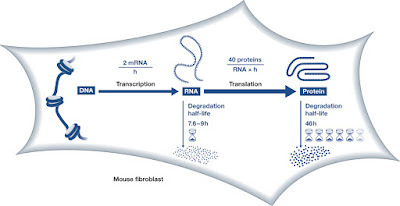 Finally, this RNA is read by the Ribosome which then synthesis a protein. (Embopress). Engineering typically means a structured way of using science to some purpose, be it the building of machines, cities or spacecraft. With genetic engineering, we usually mean literally altering the genetic code. As many people have pointed out, artificial selection is a form of genetic engineering in that sense. We know that most variation in life is heritable. Suppose we're breeding some crop. We want it to be drought resistant. We plant crops in a relatively dry environment, and only those with variations that resist that drought survive. We make it drier, and so on and so forth. Ultimately, we end up with a drought-resistant crop. However, there are numerous questions associated. First, is there actually variation in this trait? It could be that all crops do badly, but reproduce without ever changing something. You do not know how large the variation is and whether it will continue to improve. Second, you do not know what exactly you are altering. With the variation for drought resistance might come the introduction of a mutagen, poison or delicious flavour. The point is that you do not know what else it does. What we usually mean with genetic engineering is somewhat more specific and complicated. It is a process started somewhere in the second half of the latter century, and it continues to be used and improved. In principle, it means making use of molecular machines to make targeted changes to the DNA of an organism, usually a seed or bacteria. I say targeted, and it is. First, you must assess what DNA to target. For drought resistance, there are numerous possible mechanisms. Such mechanisms are identified (i.e. in a cactus) and then introduced in different organisms by targeted genetic change or even genetic insertion (putting a whole new series of letters on the DNA). The process thus involves a long study of mechanisms, followed by targeted genetic change and extensive evaluation, made even longer by the stringent safety regulations that are present all over the world. Traits such as drought-resistance, moisture-resistance, bug-resistance, disease-resistance, bigger fruit, more nutritious fruit, etc., all have clear applications in agriculture. Not all of them have been realised, and the current big crops are mostly either bug-resistant or pesticide resistant. Golden Rice, a non-profit initiative started on universities, wants to add the vitamin A precursor present in e.g. carrots to rice. This would allow an non-invasive change to the diets of regions of Asia where vitamin A deficiency is a large problem. 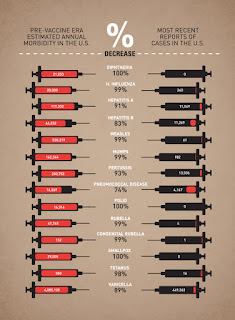 Note that already, a large number of pharmaceuticals are produced by genetically modified bacteria (example). This is the promise of genetic engineering; targeted change in everyday organisms. Can it fulfil this promise? Can it do so safely, both economically and in terms of health? That is what this series is about. The next post will be about the techniques.